Good-bye disposable income. News has dawned on DC's Brightest Day, a 26 issue, year-long, bi-weekly series written by Geoff Johns and Peter Tomasi, with covers by David Finch. Growing directly out of mega-hit Blackest Night 'DC Rebirth' starts in April's Brightest Day #0 (by artist Fernando Pasarin) and sets out to reposition the DCU, through the perspectives of key characters, such as Aquaman's widow, Mera. Stepping into the light under the Brightest Day banner are a number of new and existing series, which serve as key chapters of the overall story. The 'ongoing series' team includes Geoff's Green Lantern and Pete's Green Lantern Corps, while the 'new debuts' kick-off with Geoff and artist Francis Manapul's Flash #1 in April, with others slated to follow in May and June. The revamped Titans will have the DC equivalent of your spider-sense tingling. Under the Brightest Day banner, Deathstroke: The Terminator forms his own strikeforce in the Titans: Villains For Hire special, before hijacking the pages of the regular series. Produced by with Eric Wallace and Fabrizio Fiorentino, the book will also include The Tattoed Man and Cheshire. With more Brightest Day announcements planned in the weeks ahead - keep your eyes on the sidebar, for the latest details as they hit. 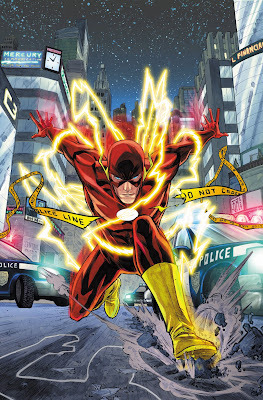 To wrap things out - Francis Manapul's full cover to The Flash #1!